A portable band saw is a cordless power saw that includes a toothed metal strip that goes in a continual cycle around 2 or 3 wheels (Source). These portable power tools will often be found in home workshops, or remote job sites, to create straight or curved cuts for metal and woodworking jobs. On the whole, wide blades are utilized for straight cuts and narrow blades can be used for curved cuts. 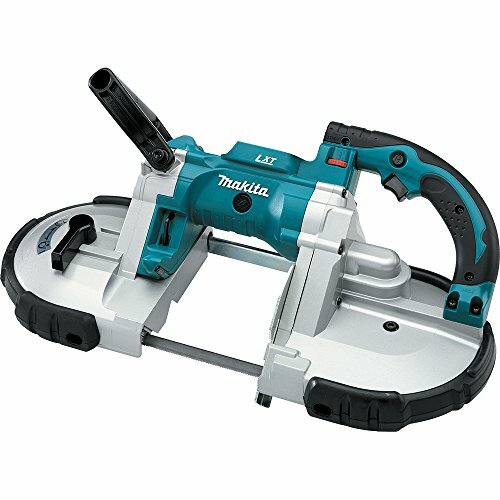 These portable bandsaws will often be regarded as more dynamic options than table saws for home based workshops, or for construction professionals on mobile work assignments. They can produce ornamental curved details such as trim on shelving, or make short work of metal piping despite being battery-powered. The 15 lb., DeWalt DWM120K is one of our top portable band saw picks. It has a five-inch deep cut capacity for rectangular or round stock and is powered by a 10 amp motor to supply enough power for nearly any job-site application. In addition, it includes an LED site light which users found helpful to use when they are in dark or shadowed work environments. The portable band saw includes a standard blade, a hex wrench, as well as a kit box. Buyers endorse its sturdiness, power and the ability of the variable speed settings to handle a range of different materials, but wish that a trigger lock was included and that the case was a little bit sturdier. ​Let's take a look at five of the best-selling portable bandsaw is on the market today and see how they stack up. The 15 lb, 14.2” x 23.5” x 7.9” DEWALT DWM120K Portable Band Saw is a superb option that features a powerful 10 amp motor with variable speed control (100-350 sfpm). Its users love that it is sturdy and powerful, but also note that it doesn’t have a trigger lock. It has a 5” deep cut capacity for round or rectangular stock. It runs on 120 V of electricity and has a safely armored cord. Serviceable steel shroud and rubber bumpers protect the unit. LED sight light allows easy visibility. A multi-position front handle gives users greater precision and accuracy. Integrated hang hook allows hanging without damaging front handle or castings. The tool comes with a hex wrench, standard 44.875- by .500- by .020-inch blade, and kit box. A three-year limited warranty and a one-year free service contract back this power tool. This band saw kit is an excellent option if you are looking for top quality, commercial grade portable bandsaw. This product garnered very positive reviews from its users. They love that it is durable and is very powerful, and as one user attests, enough to cut the extremely hard steel used in steel piers which are used to stabilize house foundations or raise settled foundations. The only comment is on the carrying case (which some feel is cheaply made), and the absence of a trigger lock, but since these do not affect the function, they are not a big deal for users. 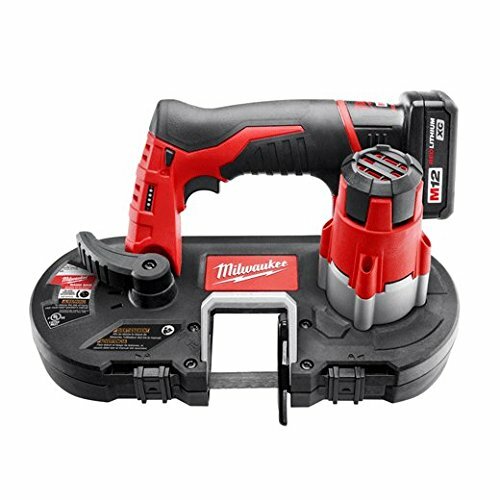 The 12.4 lb, 11.6” x 16.8” x 6.5” Milwaukee 2429-21XC M12 Bandsaw Kit is a very nice option that is small and compact enough to use with one hand. Its users love its lightweight one hand operation, but also note that it is understandably less powerful than its larger counterparts. It runs on 12 V battery and has a cut depth of 1 5/8″. The motor cuts 3/4″ EMT in 3 seconds, up to 150 cuts per charge with the XC battery. LED light highlights the cut line. The kit includes 1 saw blade with 18 TPI, a high capacity lithium-ion battery, battery charger, and a hard plastic carrying case. The manufacturer backs this product with a 5 year limited warranty. This battery-operated bandsaw is a very good option if you are looking for a compact and cordless portable band saw. Users of this product are overall happy with its performance. One user who regularly uses this power tool to cut 1/2″ and 3/4″ electrical metallic tubing says that it cuts through the metal conduit like it is butter. Another user says he was able to cleanly trim several dozens of threaded steel rods to precise lengths within a few minutes. However, since it runs on 12 V battery, some users say that it is a bit underpowered, but that is to be expected for something that is not corded. A user says that as long as what you need to cut is 1 5/8″ outside diameter, this tool will make short work of the task. 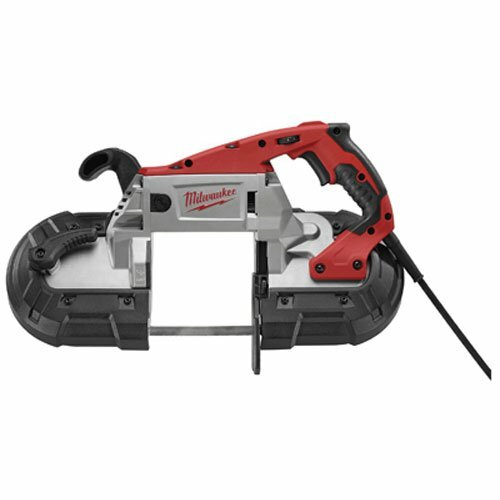 The 21.9 lb, 7.1” x 21.4” x 14.4” Milwaukee 6232-21 Deep Cut Band Saw is a very effective option that has a cut capacity of 5″ x 5”. Its users love that it is powerful and reliable, but also note that the kit does not include a saw blade. 11 amp motor runs on 120 V. It has variable speed control (up to 380 sfpm) to fit various cutting jobs. An LED light illuminates the work surface. Proprietary composite material and crush zone barriers provide long lasting rugged protection. Slimmer motor housing increases user line of site delivering superior cut accuracy. Unit comes with a plastic carrying case and is backed by a 5-year limited warranty. This deep cut bandsaw is an excellent option if you are looking for a high quality, long-lasting portable band saw. Users of this power tool are very pleased with its large cutting capacity and powerful motor. They love that it has a narrow motor housing and LED light, which contributes to greater visibility. The variable speed is also a feature that users like about the product. Only a few users have anything negative to say about it, like one who says that a power lock-on button would have been a nice touch, and another who says that it’s a little on the heavy side. Also, blades are not included. The 15 lb, 14” x 23” x 11” Makita XBP02Z 18V Portable Band Saw is a fine option that is powered by an 18 V lithium-ion battery. Its users love that it is lightweight and powerful at the same time, but also note that it doesn’t have a lock to keep it running without a trigger. The motor has 6-setting variable speed control and delivers faster cutting with 275-530 sfpm. It has a cutting capacity of 4 3/4″. A protective bumper design adds durability, a built-in L.E.D. light illuminates the work area, and a removable hook makes work more convenient. It is backed by a 3-year warranty. This cordless portable band saw is a solid option if you are looking for a battery-powered band saw. 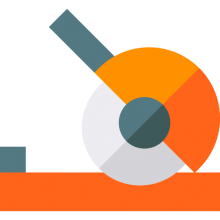 Users of this tool are generally satisfied with the power and functionality that it delivers. One user says that it’s a fantastic tool for cutting all manner of narrow and dense materials such as piping (Metal or PVC), re-bar, unistrut, channel, fence posts, etc. The battery life is excellent and the removable hook is a nice touch. One user says that he likes how the hook allows him to hang up the tool when not in use while working on a ladder. The 17.4 lb, 21” x 6.5” x 12.5” Milwaukee 6238-20 Portable Band Saw is a very good option that has 2 speed settings (300 and 380 sfpm). Its users love that it is well-made and has a great cutting capacity (5” x 5”), but also note that it doesn’t have a built in light like the variable speed model of the same brand. Its powerful 11 amp motor runs on 120 V.
It features a new and exclusive armor technology made of proprietary composite materials and crush zone barriers that provide long-lasting protection. This two-speed band saw is an excellent option if you are looking for a powerful corded band saw that is slim and relatively lightweight. Most users of this portable band saw agree that it is made of high-quality materials, and has an excellent fit and finish. One user says that the black plasticized rubber covers are flexible but stout, and the tool has survived falling off a 42″ tall workbench onto concrete. Changing the blades is also extremely easy. Another user likes that the built-in safety switch gives him peace of mind. Many users concur that it is one of the best tools for its price range. Buyers who purchased the DeWalt portable bandsaw were impressed by its power, sturdiness as well as its variable speed settings that enabled them to cut a range of different materials. Some opted to purchase it at Home Depot, Walmart, looking for the best price- while others resorted to scouring the internet for the best deals. Generally, it's best to purchase online if you're not in a hurry because, in general, you'll find better prices from e-retailers. Some reviewers thought that the frame's threads located near the hook mounts could be a bit stronger and they also thought that the included carrying case was a little bit too flimsy for rough jobsites. Another reviewer posited that a trigger lock would've been a handy and inexpensive addition for DeWalt to have included. One professional service technician that maintains multiple construction properties for over a decade says that it can easily slice through thick metal, albeit at a relatively slow rate. He also appreciates how rugged and heavy-duty the cord is- it's just the right length and he says that even on rugged job sites where there's a lot of chaos and people end up picking the tool up by the cord that it hasn't malfunctioned or broken. Another positive this particular reviewer noted is that the DeWalt portable bandsaw features a tool-less blade change. He says that it is remarkably easy to change out the blades without using tools or damaging your fingers. 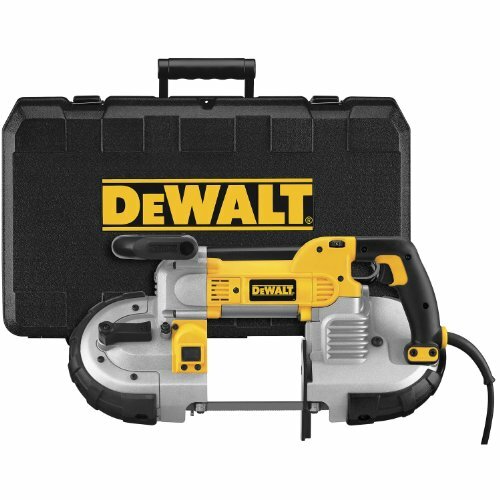 One other reviewer describes having used a sawzall for all of his metal-cutting purposes until he was able to get his hands on this DeWalt portable bandsaw, saying that it is much easier and faster to use for those types of metal-cuts than the sawzall. He particularly appreciated the light that is included with this bandsaw, saying that usually when you're using it you end up blocking all of the lighting sources and it becomes difficult to see your pencil markings as you make your steel cuts. Cordless More Powerful Than Corded? The Milwaukee 2429 Bandsaw was another popular option. It has many advocates, all of whom say that it is a powerful and reliable tool- particularly if you hate manual sawing with something like a hacksaw. One reviewer says that he would not have been able to complete a particular construction project without the ability to trim threaded steel rods to precise lengths- and this particular Milwaukee power tool was able to accomplish the task in under 10 minutes. Another buyer describes using it to perform some cutting on a heating system's copper tubing. He had to crawl into a really tight and disgusting crawlspace where loose copper was hanging and says the Milwaukee portable bandsaw was essential to accomplishing the task because his usual reciprocating saw would've caused too much vibration to have been able to use it in such a tight and confined area. He responded to some critics who said that it is an under-power tool, saying that because it is powered by a 12-ball battery you're not going to get the same amount of power and force out of it as you would using a bandsaw that is corded. That said, it is definitely faster than a hacksaw and once you get experienced using it most reviewers found that they were able to accomplish most of what they needed to do with this portable bandsaw- endorsing its practical mobility functionality. The Makita was another option that we examined and the manufacturers boast of its six different variable speeds and it's 14.3 pound weight. As a cordless option, many users were satisfied with this specialized power tool, saying that they have used it to cut a range of different dense and narrow materials including fence posts, PVC and metal piping as well as rebar. In terms of its battery life, reviewers say that in general it has functioned for the length of the task they were using it- whether they were on a remote job site without power, or just working on a roof, using it for an afternoon. One negative that some buyers pointed out is that it is a little bit heavier than other mobile band saws on the market, but it assured them that the quality of its construction was pretty sturdy. Another user said that while it is a little bit heavy, and he wouldn't want to use it for an extended period performing overhead cuts, it was the perfect tool to cut down on some industrial metal piping at a worksite- saying that all of the cuts took around nine seconds and it didn't produce any sparks from its cut-off wheel. If you are in the market for one of these heavy duty cutting machines, keep in mind that since they are portable and cordless band saws that they don't pack the same punch as traditional corded options. That said, manufacturers have come along way in producing portable bandsaw kits that are rugged, durable and powerful enough to perform most application-specific cutting jobs. The Dewalt, for instance, uses blade tracking adjustment technology to enhance the blade alignment, helping to decrease wear and enhancing the life of your blade. In addition, ergonomic advances have made them easier to handle- using multi-position grips so that you can use them in tight spaces at a variety of different angles to perform difficult but accurate cuts. In all, many power tool users are happy to have discovered these options, finding them useful for remote job sites, performing DIY home repairs, and in general appraise them an excellent alternative to cutting metal than using a hacksaw or sawzall.